Handheld optical tachometer with RS-232 interface, with software for transferring readings and a counting function. The handheld tachometer also has an optional adaptor available for making contact measurements. Thanks to its capability to transfer readings, the tachometer is well suited to be used in experiments or scheduled tests for determining the number of revolutions in the field of research and development. It's also possible to make an accurate calculation of pieces or products that pass along a conveyor belt. This handheld tachometer has a tripod mount on the bottom allowing the user to screw it onto a tripod. The readings obtained by the device can be transferred to a computer with software, which is included in the order, and which allows the user to export the data to other programmes or evaluate the readings taken by the tachometer. If you are looking for a handheld tachometer with similar attributes but without an RS-232 interface and software, please click here. 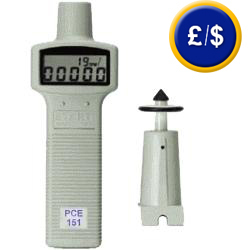 If there are any questions about this tachometer PCE-151, please have a look at the technical specification below or call: UK customers +44(0) 23 809 870 30 / US customers +1-410-387-7703. Our engineers and technicians will gladly advise you regarding the tachometers or any other products in terms of regulation and control, or scales and balances of PCE Instruments. 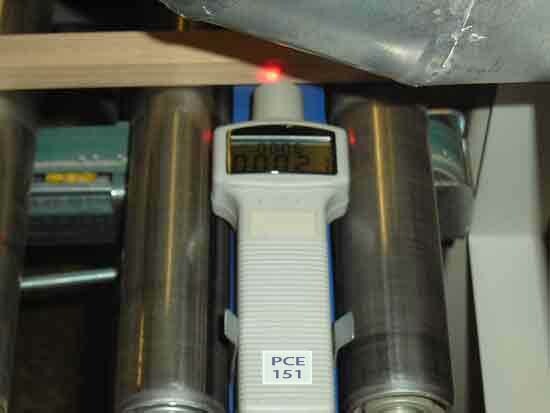 Here you can see the tachometer PCE 151 during measurements on a machine that cuts wooden strips. The software included in delivery of the tachometer PCE-151 is designed for a transfer of the measurement values from the device to a computer or laptop. The values can be also indicated as a column of figures, graphics or the values as an analogue or digital image. The data can be transferred to other editing programs any time, e.g. MS Excel. The tachometer can be also controlled with the software. 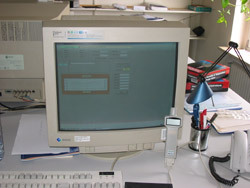 Here you can see the tachometer PCE-151 connected to a computer. This image shows the layout of the software delivered with the tachometer PCE-151 for analysis and editing. the function table is shown on the left with the starting and programming function while the indicator is shown on the right side (digital / analogue). The measurement values can be also transferred to Excel. If demanded, the tachometer PCE-151 can be also certificated. The certificate is accordant to ISO standards and assures the measurement accuracy of the tachometer PCE-151. For companies that want to admit the tachometer PCE-151 to their internal pool of test devices. The certificate is accordant to ISO standards consists of a calibration including a sheet with all the measurement values. The name and address of the customer will be written into the calibration certificate. Adapter to measure under contact. The measurement wheel can be easily adapted to the top of the tachometer. This adapter is mandatory for measurement under contact. For any long-term measurement on machines or experimental facilities it can be useful to install the tachometer by means of this tripod stand. Thus you can measure continuously.